A bargain that is likely to fetch up in budget systems and can confidently survive upgrades to both preceding and following parts of the chain. 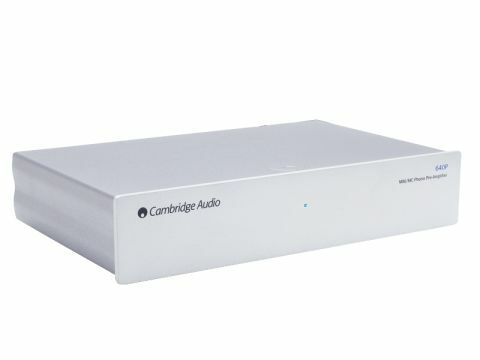 With its successful Azur series of integrated amps all being line-level-only, Cambridge Audio had good reason to produce a matching phono stage. Indeed it produces two: the cheaper 540P handles moving magnet cartridge only, while this one also caters for moving coil types. The price is modest, but we were frankly astonished at the amount of circuitry inside, integrated circuits and discrete transistors aplenty, plus decent-quality passive components. Power is from the usual 'wall wart'. There's even a switchable subsonic filter, which is more sophisticated than most and works well and practically inaudibly. We were most impressed by this unit. It is subjectively very quiet with both cartridge types and never fails to produce a very clean and well-defined sound. It seems particularly good at extracting detail from the upper treble, giving excellent sweetness on bright instruments (like violins) and maintaining a good standard of stereo imaging even in complex multi-layered music. Bass is assured and controlled and midrange uncoloured. There's, perhaps, not quite the rhythmic excitement and attack that we have heard from upmarket phono stages, but at this price it would be unfair to demand it and results are really more than satisfactory. Measured figures for noise, response flatness and distortion are all typical of much dearer phono amps and headroom before overload is very good indeed. Capable of extracting the most from even quite fancy cartridges, this is a starter phono stage that you can expect to rise to the challenge as you upgrade the system around it.